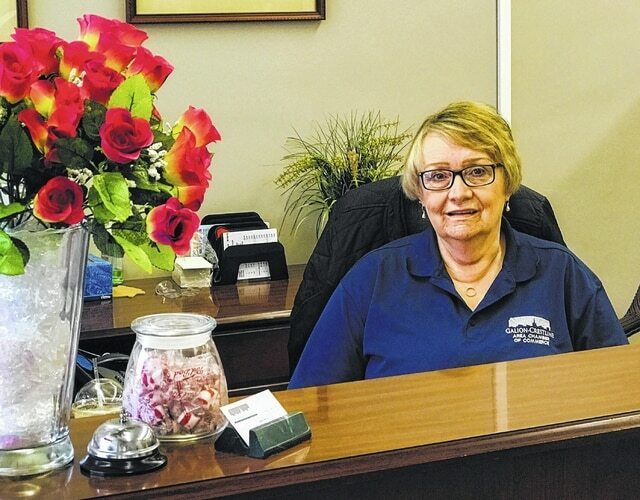 GALION — A door closed and a window opened for Judy Dyer when she landed her position as the administrative assistance at the Galion-Crestline Chamber of Commerce in 1992. Her part-time job at National Jewelers had ended when the store closed. “Dan Ritchey called and asked if I wanted a part-time job at the Chamber and I said sure, I’ll do that,” said Dyer with a smile. Ritchey was the first director Dyer worked under at the Chamber of Commerce. “At that time, the office was at 126 Harding Way East. In 1998, Dave Dayne became the director,” Dyer said. The office would change locations two more times before ending up at its current location, 138 Harding Way West. “We were at 106 Harding Way East and for about 10 months we were down the street at 419 Harding Way West,” said Dyer. Dyer has spent the most time with the third director she has worked with at the Chamber, Joe Kleinknecht. Kleinknecht said that the chamber’s main purpose is to promote the members of the Galion-Crestline Area Chamber of Commerce. Kleinknecht said from awards banquets to holiday open houses, Dyer has been by his side to get things accomplished. “We work very well together and she will be missed. I can be thinking of an idea about something and she will have the same idea. It will be hard to replace her,” said Kleinknecht of Dyer’s impending retirement at noon on March 1. Dyer said a replacement has been hired, Miranda Jones. The first item she will check off her list is a trip to Nashville. “I am so excited about the trip. There are 17 of us going and it will be a lot of fun,” said Dyer. Kleinknecht, with the help of Dyer’s family and friends, managed to pull off a surprise retirement party for her last Friday at the Galion Elk’s Lodge. “It wasn’t easy, but we managed to do it without her finding out about it,” Kleinknecht said. Dyer said she loves being around people.